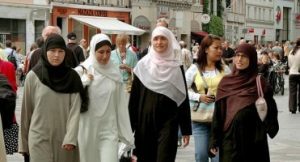 Recent research suggests some of the European country’s Muslim population might triple as a percentage by 2050. A Pew Research Centre reported that even if all immigration to the continents stops, Europe’s Muslim population is expected to grow over the next few decades. Three scenarios were modeled considering the mid-2016 estimate of 25.8 million Muslims who would be living in Europe by 2050. The future migration rates were assumed and under the ‘zero migration’ scenario an estimated 30 million Muslims will make 7.4 per cent of Europe’s population by 2050 as compared to 4.9 per cent comprised last year. Muslims on an average 13 years younger than other Europeans have a higher birthrate. In the ‘medium migration’ scenario 58.8 million Muslims account for 11.2 per cent of the population which has migration maintaining a ‘regular speed’. The Pew researchers defined it as migration motivated by economic, educational and family reasons and not for seeking asylum as a refugee. The study projected that in the ‘high migration’ scenario the record flow of migrants coming to Europe would continue indefinably that will result in 75 million Muslims in Europe by the middle of the country. The researchers concluded that Muslim as a group would be considerably smaller than the populations of both Christians and people with no religion in Europe. The study was based on census and survey data of 30 countries that covered 28 European Union members plus Norway and Switzerland. As per the Pew report not all countries would be affected by future immigration.